In the afternoon on 2nd September, a whatsapp message was sent on various groups, requesting volunteers at the SMA office. ICA had set up a collection point for relief items at SMA – clothes, bedlinen and kitchen utensils. The drive was to run from 1st to 2nd September only. They thought they could cope with the sorting and packing of items to be shipped to relief camps, to be distributed through their partner NGO in Kerala. By Sunday afternoon, the office was full from floor to ceiling with boxes of neatly packed items. Volunteers did their best to sort, pack, label and document every single box, but were struggling with the load. The items kept flowing in though, much like the water through the dams of Kerala. They simply could not keep up with the volume of material coming in. Thankfully, many volunteers responded to the whatsapp message for help. By 3pm, the team was running a production line like a well-oiled machine. Everyone had a role to play. Some were neatly wrapping fragile utensils in sheets of newspaper, some were folding and sorting clothes into the respective boxes, some were taping the boxes shut and labelling them, and others were weighing the boxes and recording the weight and dimensions of every single box. Everyone knew what to do – though there was no leader. The team had organically organized themselves to accomplish the task. Even Kumarettan, the SMA president, and Prem chettan, SMA VP, were there – doing the same work as everyone else – very hard work. Because as the Onam song goes, “Manushyarellarum onnu pole (മാനുഷരെല്ലാരും ഒന്നു പോലെ)”. At 8.30pm, the lorry arrived. Everyone gathered the last ounce of energy in them and pushed hard to load all the boxes onto the lorry, to be taken to the container. 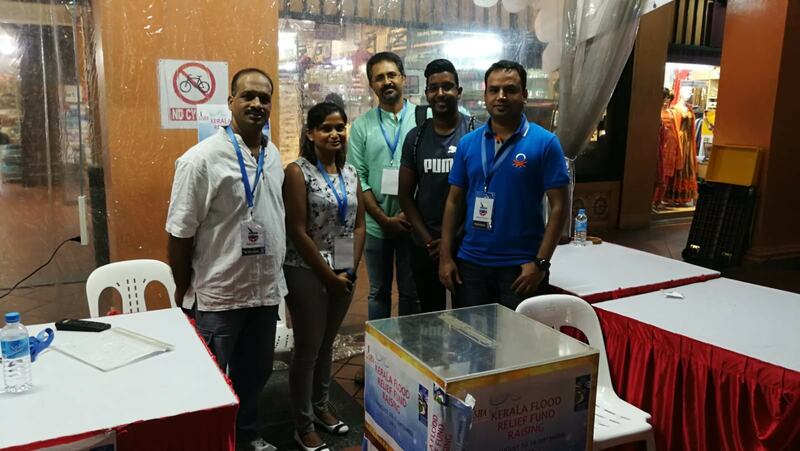 This seemingly trivial task of collecting and sending relief materials to help our brothers and sisters in Kerala turned out to be a mammoth task – but through the efforts of everyone who stepped forward to answer SMA’s call for action, it was accomplished successfully. Close to 200 boxes of items were sorted, neatly packed, labelled and transported today. ICA and team, under the leadership of Mr. Shaji Alias, did an outstanding job – from the planning to the execution of this drive. But they could not have accomplished this on their own – we are stronger together, with all our well-wishers and volunteers. Focus Malayalam also played an instrumental role in the success of this drive. SMA members and office staff did a phenomenal job as well – and provided adequate chaya and vada of course! 😉 Mrs. Uma Sankar coordinated the shipping – to ensure all our efforts culminate in a positive impact by reaching those who really need the materials. A huge thank you to SMA’s own army – all of you! The collected materials will be directly handed over to the flood affected people by an NGO in Kerala. Thank you for your kind heart & effort in ensuring all material you are donating is in good condition! Singapore Malayalee Association, 44 Race Course Road. * New or almost new clothes ONLY, please. * Please wash, iron, fold and sort before bringing to collection centre. Else it won’t be accepted as it will slow down the collection process.